Whether using Shower Discs and Aromatherapy or using a diffuser. The Waterlilies And Company Aromatherapy products can be very powerful, healthy, and uplifting. There are many people who spend a lot of time studying different oils and their benefits and healing properties. It is a big field and I have learned a lot even over the past few years. I have been convinced of the benefits. When we begin to get colds, I put eucalyptus, peppermint, and tea tree essential oils in a diffuser. This helps to kill bacteria throughout our sinus. Cloves is also a great antiviral oil. Here’s the kicker though. You must be very familiar with the oil you are using. Essential oils can be extremely powerful, even if all you do is breathe them in. Know what you are using and less is better. They are so strong you don’t need to pour half a bottle into your diffuser. A few drops are enough. Frankincense is great for many reasons. One thing it does is to help drain or cleanse your systems. If someone in my household is getting a sore throat I will rub a tiny bit of diluted frankincense (20% frankincense, 80% carrier oil) onto their lymph nodes in their neck. Every time I have done this (along with cloves), the sore throat is gone within hours. For beginners, eucalyptus, rosemary, tea tree, peppermint, and lavender essential oils are pretty mild and good starter oils. Otherwise, learn about the other oils because there are so many powerful healing oils in Creation. One great way to reap the benefits of essential oils is putting them in the air. The difference between diffusers and shower discs? Shower discs are cheaper and can go right into the shower, creating a stream therapy session for you. 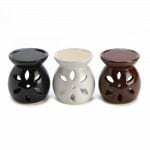 You can get a cheap oil burner such as the candle burners or plugins. Just make sure the candle you buy is not toxic. Add water to the cup and sprinkle a few drops of your favorite essential oil into the water. Light the candle and enjoy. Some oils last longer in the air than others. They break down quickly so use it in the room that you are in and when you are ready to breathe it in. When we are fighting colds I will often do this, even setting it on the table as we work. Or you can use a diffuser that is made for essential oils. These really are amazing and do a great job of distributing the oils into the air. In my experience I find that price does make a small difference. Cheaper diffuser work really well, but some more expensive diffusers seem to make a finer mist that dispurses the oils into the air in a larger area vs just a few feet from the diffuser. 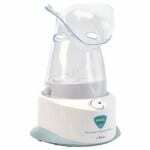 Lastly, you can buy a personal steamer like in the picture on the left. I actually found one of these at Salvation Army for $2 and I love it. I take the top off, add some water and oils and let it steam. It works great! These little discs are great for when you have a cold. They are easy to make and make great presents. The essential oils you add can vary, depending on your preference. As the name implies, they are made for the shower. Simply take one in with you. Set it on the floor of the shower out of the steady stream (behind you works well), and enjoy the aromatherapy in the shower. 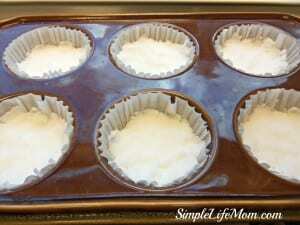 Add water slowly to the baking soda until you have a thick paste. Pour mixture into each cup and let stand for 12 - 18 hours or overnight. Remove when it is set and store in airtight container until needed. Essential oils will break down over time so you don't want to make these months in advance, though they will revive a bit within the shower. To use: place one on the floor of your hot shower and inhale as you shower. in place of clove, you might try tangerine. I love this idea – thanks for the tip. Love this idea (just been explaining to hubby in excited tones and it lost something in translation)! I’m so going to try this. Love the idea of lavender oil shower bombs. Do you crush the cloves or is there an oil from cloves you can purchase? I use clove essential oil. Yea! Thanks so much for sharing these on Oil me UP Wednesday. I made some of these a year ago or so and was reminded of them the other day, but couldn’t remember where I saw the recipe. I will pin yours. This is an older post, but very relevant all the time! Thanks for the recipe and the idea. 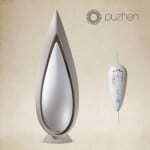 (LOVE E.O.’s but never thought about using them in the shower!) These will make great gift ideas for my daughters! I would probably use silicon cupcake ‘liners’ though …they are reusable! I actually might try these with a smaller amount of baking soda so I’m not putting so much into my septic system. I’d probably use a silicon candy mold or some other small mold, then put them in the silicon cupcake mold for dispersing. Again, THANK you for this recipe! I also might try adding in some Epsom salts to replace SOME of the baking soda for a little magnesium ‘lift’! Good idea to add epsom salts! I think I will steal that idea. Thanks! Could you make a batch and freeze them to have ready to go when you need an extra boost in the shower? Or would the oils break down too much in the cold? Thanks for the recipe either way! You could freeze them. Just make sure they’re sealed well in a zip top bag or something similar.